Inspired performance meets zero emissions at the Paris Motor Show Representing a bold next stage in Infiniti’s quest for performance luxury motoring in the most sustainable way possible, the Infiniti LE Concept is a true Infiniti with just one thing missing – a tailpipe. Making its European debut at the Paris Motor Show on September 27 in Hall 1, stand 224, the LE Concept will line up alongside the award-winning Emerg-e sports car concept and M35h production hybrid in a powerful display of “no compromise” performance motoring. 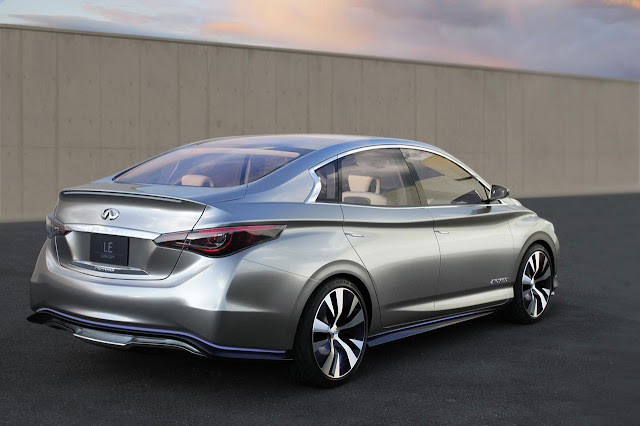 "Infiniti believes the future of luxury lies insustainable luxury and we intend to continue taking a leadership role to achieve it,” added Loire. Infiniti’s most expensive and exclusive car - the FX Vettel edition - will be displayed alongside Red Bull Racing F1™ car. Combining driving appeal with zero emissions in a dramatically-styled compact saloon body, the all-electric LE Concept is being shown in Paris with a pledge that a production version will be on sale in selected markets in around two years’ time. The showroom model will not only share the LE Concept’s advanced powertrain but also much of its design character – one that shouts “dynamic luxury” rather than “electric vehicle”. Also in line for production are its highly crafted cabin and user-friendly technology – including the possibility of a ground-breaking wireless recharging system. An all-new design, the four-door saloon body combines dynamism and elegance with signature Infiniti design cues and the latest Infiniti design language. The proportions are typically well balanced, the high rear deck injecting a sensation of movement. Up front, there’s the expected double-arch grille but here it also features a charging port hidden beneath the illuminated centre Infiniti emblem. 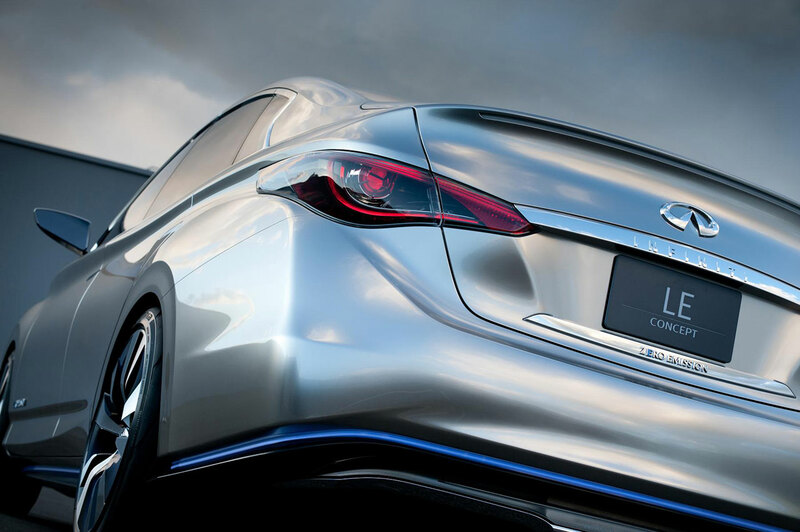 The LED headlights and taillights echo the design direction of Infiniti’s recent concepts, as do the crescent-cut rear pillar and strong shoulder line, which express flowing movement. The front spoiler, rear diffuser and side aero fins – all glowing with integrated illumination – contribute to an impressive Cd (drag coefficient) of 0.25. At around 4.7m long, the LE Concept is a similar size to the Infiniti G Saloon, supporting Infiniti’s belief that zero emissions does not have to mean small. Nor does it mean plain: the cabin is that of a true luxury car, capitalising on the silence of the electric drivetrain to provide a tranquil ride at all speeds. Next-generation instrumentation and connectivity are previewed by the LE Concept, but being an Infiniti, hospitality – evidenced by its soft lighting, excellent visibility and welcoming openness – is just as important. The LE Concept does not compromise either on roominess or comfort. The advanced packaging solution of placing the lithium-ion batteries under the floor not only provides a no-compromise approach to luggage and passenger room, but also contributes to the vehicle’s low centre of gravity, enhancing handling. Staying true to the Infiniti creed of Inspired Performance, the LE Concept is designed to stimulate rather than sedate on the road. This is achieved by a high performance electric motor with 100kW (134PS), along with 325Nm (240lb ft) of torque. The target for the engineers was “impressive EV acceleration without sacrificing the range”, is expected to be around 160km. A sculpted shift knob controls the drive system, which offers several driving modes, while a centre cluster shows information such as a dynamic range calculator, using a mix of digital and analogue displays. The battery system is a proven laminated 24 kWh lithium-ion (Li-ion) design with a ChaDeMo DC50kW quick charger that can deliver an 80% charge in 30 minutes. Other charging options being looked at include an innovative home-based Wireless Charging System. This uses a coil safely encased in the charging pad to charge the battery via inductive energy flow. The Intelligent Park Assist feature will automatically align the vehicle over the charging pad for optimum charging and the driver can walk away, with no cables to connect. The high-frequency, non-contact charging, controlled by the car’s display or by smartphone, is safe for children and pets and can be installed easily in a home garage. “A luxury car for a new generation of sustainable luxury buyers must not compromise on performance. Buyers want ‘green,’ but won’t settle for any aspect of the driving experience being less than that of their current luxury vehicles,” said Bernard Loire. 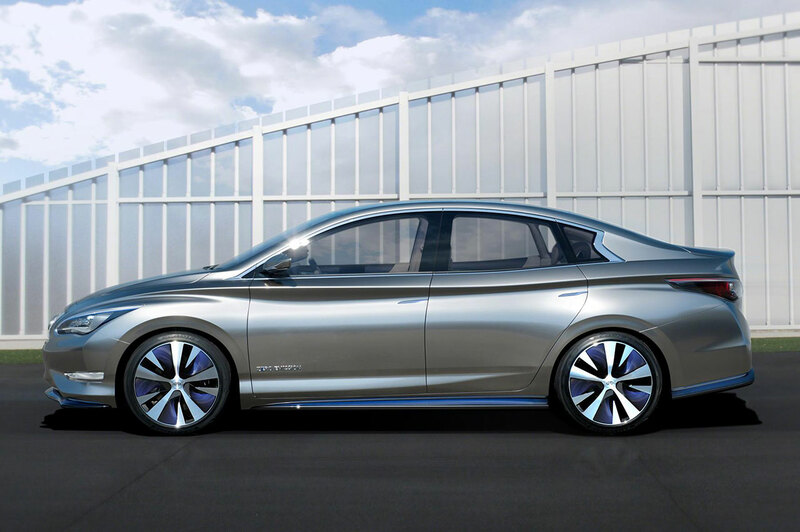 The LE Concept’s zero emissions credentials and pure approach to luxury define a new class of compact premium electric vehicles that Infiniti intends to lead when a production version goes on sale, scheduled for 2014. The Paris show will be the first public appearance of the Emerg-e concept since being nominated as one of the winners in the concept category of the Automotive Brand Contest, an important international design competition organised by the German Design Council. The award reinforces the acclaim which followed the car’s premiere at the Geneva Motor Show earlier in the year and the dynamic debut of a fully-functioning prototype at the Goodwood Festival of Speed. The Infiniti Emerg-e is the ultimate expression of Infiniti’s inspired performance. This 402bhp (300kW) mid-engine, twin motor, electric powered sports car is capable of accelerating from 0-60mph in just four seconds - and from zero to 130mph in a single, seamless 30 second burst. It signals an array of exciting new technologies that the brand will adopt in its quest to build dramatic and sustainable high performance cars. Infiniti Emerg-e also provides a fresh expression of Infiniti’s design language applied to a potential high performance, mid-ship sports car for the first time. Alongside the Emerg-e concept on the stand and summing up Infiniti’s no-compromise approach in production form, the M35h is being shown in Paris in its latest, even cleaner guise with CO2 emissions of 159g/km – while still able to accelerate from 0-100km/h in just 5.5 seconds, making it the world’s fastest-accelerating hybrid saloon, as recorded by Guinness World Records. Performance of a more traditional kind – courtesy of a 420PS 5.0-litre V8 – will be displayed in Paris thanks to a rare public sighting of probably the most exclusive crossover ever made, the Infiniti FX Vettel Edition, developed in association with Formula One Double World Champion Sebastian Vettel. Just 50 examples have been made available for Western Europe, costing from £100,800, with many already spoken for. Completing Infiniti’s display in Paris will be the extravagantly well equipped Premium versions of the FX30d luxury SUV and EX30d crossover, both powered by Infiniti’s highly efficient and torque-rich 3.0-litre diesel V6. The Infiniti G range will be represented by the G37 Cabriolet, the two-door sports coupé with all features as standard, including a potent and musical V6 engine and electrically retractable hard-top for a seductive open-air driving experience.